When, how, and why did the state enterprise system of modern China take shape? The conventional argument is that China borrowed its economic system and development strategy wholesale from the Soviet Union in the 1950s. 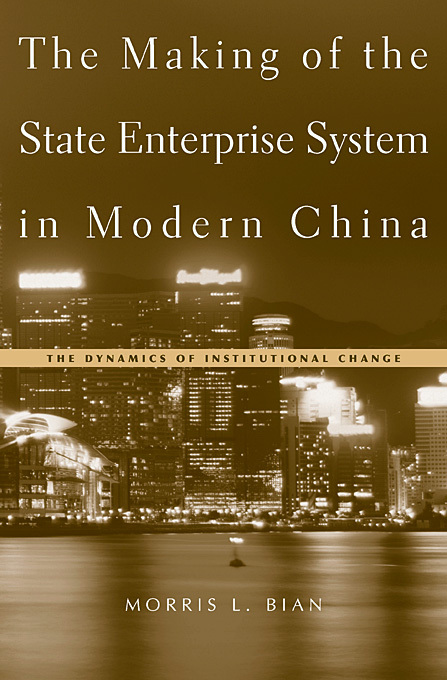 In an important new interpretation, Morris Bian shows instead that the basic institutional arrangement of state-owned enterprise--bureaucratic governance, management and incentive mechanisms, and the provision of social services and welfare--developed in China during the war years 1937-1945. Bian offers a new theory of institutional change that explains the formation of China's state enterprise system as the outcome of the sustained systemic crisis triggered by the Sino-Japanese war. This groundbreaking work combines critical analysis of government policies with case studies of little-studied enterprises in heavy industries and the ordnance industry. Drawing on extensive research in previously unavailable archives, Bian adds a valuable historical perspective to the current debate on how to reform China's sluggish and unprofitable state-owned firms. Morris L. Bian is Associate Professor of History at Auburn University.